No time for survey reporting and analysis? Need some help? Discover your essential business stories without the effort. In 3 simple steps. Our Reporting Team can create pretty much any kind of reporting you need from your survey data. And if we can't do it with the powerful tools we already have, we'll create new ones so you can get exactly what you need. Page titles help give context and structure to both surveys and reports. Using the same number of scale points and consistent labels makes for better summaries and also saves respondents time. If a question needs a long explanation, try putting it in text before the question itself, i.e. in a page description (or in brackets after the question text, like this). We all learn through feedback. Even survey designers! Realistic previews with test data let you visualise results before collecting answers. You can see exactly what your reports and slideshows will look like, share them with others and get their feedback or sign-off too. All before you launch your answer collection. 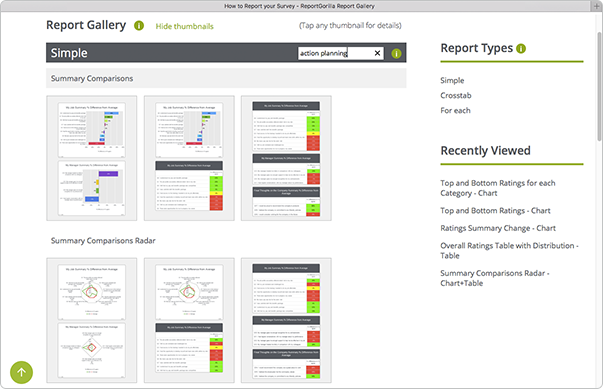 Just open the survey you are developing in ReportGorilla and run any available preview. You'll see exactly how your survey would be reported if you already had your data. The trick - or opportunity - is to do this while you can still modify your survey design. Since previews are free, you can do this as many times as you need to until you get your survey just right.